FYI, the craft in this album is the CX-V93. It’s about the same thing except with Wheesleys instead - but it was deemed unsafe because of a lack of control and emergency power when needed. The CX-V93’s badass brother. Sure, it’s not nearly as efficient but it goes fast, can do better turns, and is actually a tad bit safer due to the extra controls. Don’t run this in wet mode unless you have to. It’s not very efficient to begin with, being a glorified air taxi and all, but the wet mode certainly doesn’t help. The C-VH99 is, like the rest of my aircraft, fully stock. It’s 140 parts, so nothing too bad. To switch between vertical and horizontal, press 1 and then immediately use ] to switch to the engines. Using the SAS, rotate them until they’re aligned in the direction you want to go. If they don’t latch on their own - try to align the docking ports yourself. Root part is the Mk3 cockpit in case anyone needed to know. Credit goes to EJ_SA for the inspiration of this craft - the K-29B. Check him out, he does great stuff. 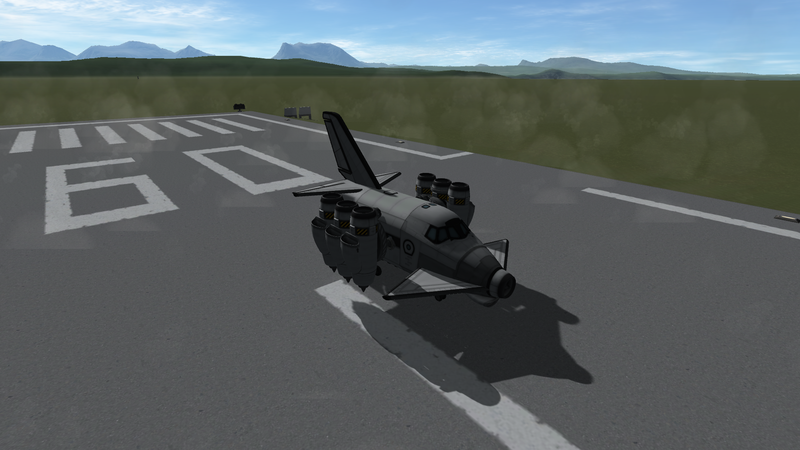 Built in the SPH in KSP version 1.3.1 by Coolstorm10.